Join us in helping the world, one step at a time. 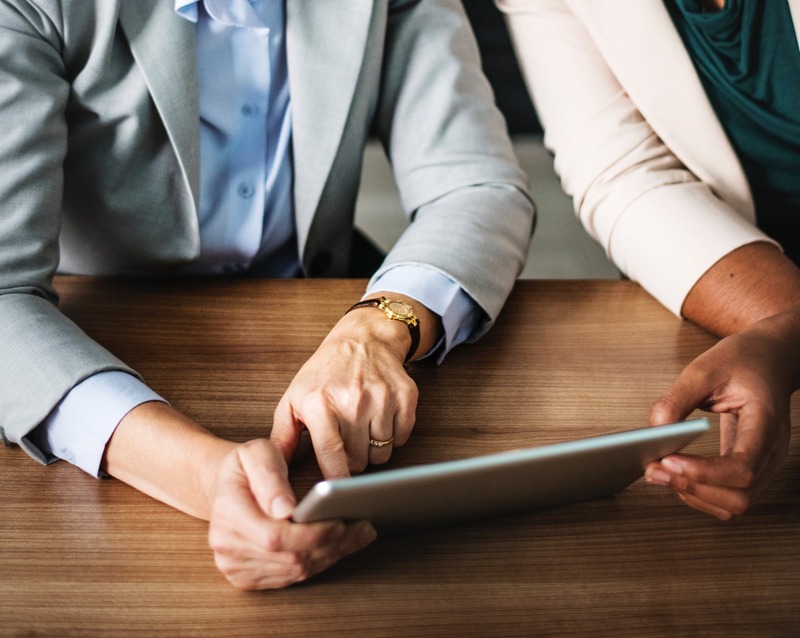 Here at our Houston hotel with a shuttle service, complimentary breakfast, and Kaypr tablets in each of our rooms, we’re dedicated to providing the best possible guest experience in addition to supporting our local community. Each of our curated rooms includes all the convenient amenities you need within the comfort of your room, including high-speed Wi-Fi, mini-refrigerators, and flat-screen televisions. Come downstairs to explore our art gallery and join us for a drink at the bar, with our unique water droplet decor! 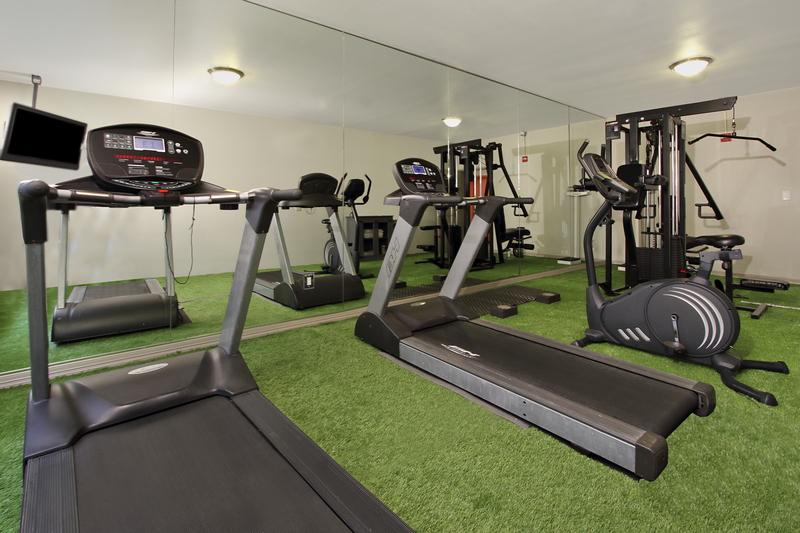 See below for more of our on-site amenities here at Hotel Ylem. There’s a Kaypr tablet waiting in each of our boutique hotel rooms and suites, your own personal digital concierge. Make your stay in Houston as effortless as possible with the tablet’s convenient apps and features. Request towels to your room, enjoy a selection of lullabies, and set your alarm clock all from the comfort of your room. Plan your transportation downtown with our Houston hotel with shuttle service from the tablet! Start your morning by reading the Wall Street Journal and relax in the evening with a movie on Netflix. The Kaypr tablet also includes information about the area so you can check the weather and learn more about nearby attractions. 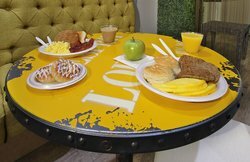 Breakfast is available from 6:30 AM – 9:30 AM. Visit all the hot spots in the Museum District or enjoy a stress-free ride to your morning appointment at the Texas Medical Center. We offer a complimentary shuttle service within a 3-mile radius of our Houston hotel. Our shuttle was painted by a local graffiti artist, and runs hourly from 7 AM – 7 PM. Looking to get to or from a further location, like The Bush International Airport? 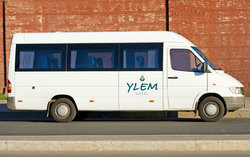 Hotel Ylem works with a third-party shuttle company to ensure our guests have access to efficient transportation throughout their stay with us. 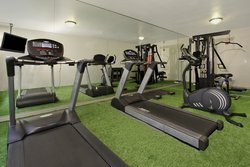 *Transportation charges booked with our third party company can be charged to the guest room or payment can be made with a credit card or cash with the driver. Host your informal gathering at one of our meetings spaces here at Hotel Ylem. The Space, our designated meeting area, is ideal for your next Houston meeting of 15 people. 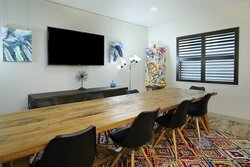 The Space comes equipped with a boardroom table and large TV. 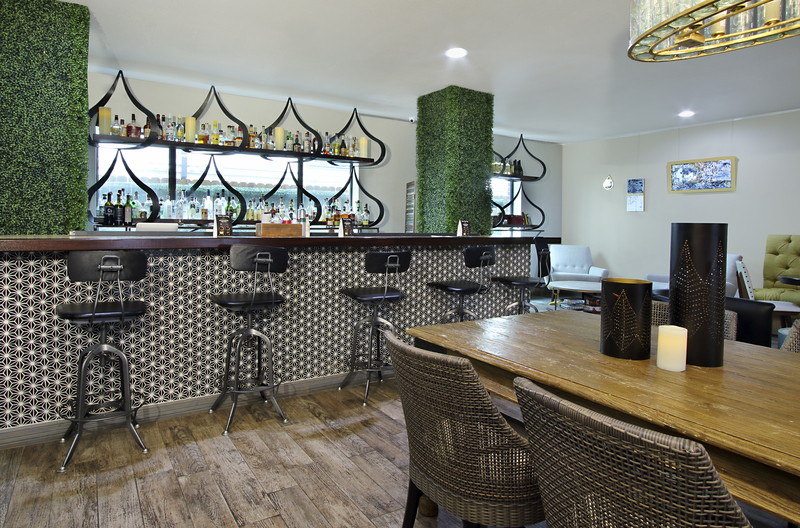 For more informal meetings, our trendy Bar Esperanto can accommodate up to 50 people. Stop by our on-site bar for an evening of networking and cocktails, with 9% of all proceeds going directly to charity:water. Fill out our General Inquiry form on our Meetings page to book The Space or Bar Esperanto for your group! Sip one of our signature cocktails and help us give back to the community, with 9% of all proceeds going directly to charity:water. Try a ‘Kindness of Strangers’ or a ‘Dadimaa’ cocktail, and sit back to admire our unique water droplet décor. With our central location, the Bar Esperanto is the ideal place to meet up with friends before an evening meal or to wind down at the end of a day of meetings. Bar Esperanto is open from 5 AM – Midnight. We strive to make our guests happy at Hotel Ylem, that’s why we have dedicated Happiness Center Services available at our front desk. Our mission is to ensure each and every individual staying with us leaves with a fresh perspective on the hospitality industry. Stop by our front desk, or order a service from the Happiness Center on the Kaypr tablet in your room. Order up some extra blankets to your room for additional coziness, or borrow one of our plug-in electronic leg massagers to give your tired legs some TLC after a busy day walking around Houston. Our front desk also has self-serve coffee available 24/7 for you to pick up a fresh cup of Coffee America, a local Texas-based brew. Refresh your suitcase with our on-site laundry machines or send out your suit for dry-cleaning. Our new washer and dryer have a credit card and coin option. 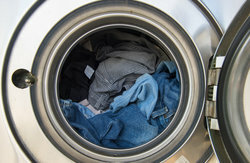 Simply drop off your dry-cleaning at the front desk by 8 AM for same-day service. 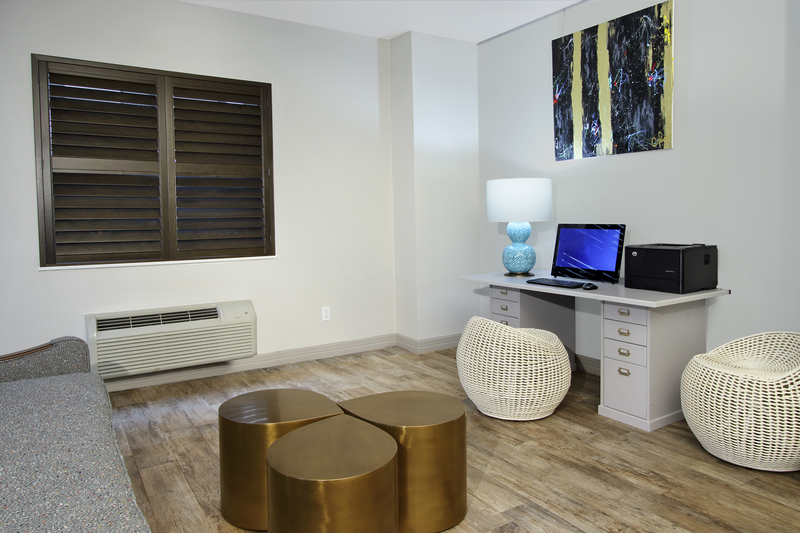 Work outside the office with ease at our dedicated business center! Catch up your emails at the desktop computer or print off any hard copies you need. 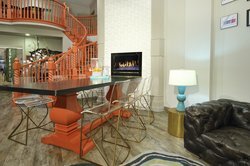 We also offer complimentary high-speed Wi-Fi throughout the hotel. 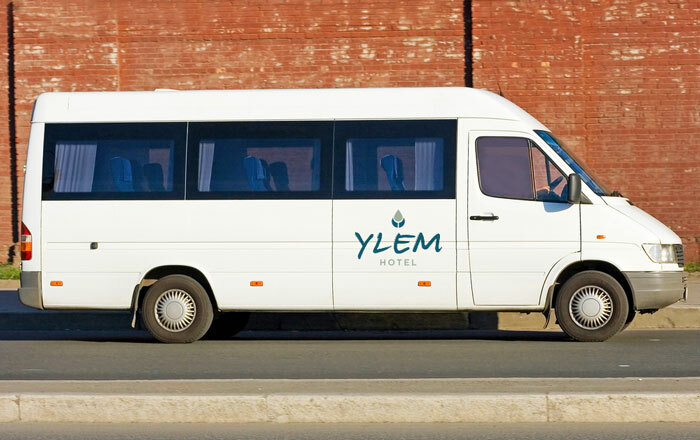 Ideal for corporate travelers, Hotel Ylem is minutes away from Texas Medical Center, Conferences at Rice University, and NRG Park.